That was some wicked weather we had today! Severe thunderstorms, hail, wind, yeesh! I am hoping to head on up to Poet's Tower this Friday, but we will have to see how the stars line up for me. Between the weather, the wedding (only a month away), and work life getting hectic I seem to have no time for hiking. Sad panda, I am. July 28, 2008 - Update? What update? Well...not only have gas prices been keeping me close to home, the weather has been too. Two trips to Quabbin have washed out due to rain, as has yet another trip I was going to go on this past Friday. So instead I will share some news from AlpineZone.com. CONCORD, New Hampshire -- On July 2, the State of New Hampshire increased its ownership of the land at the summit of Mount Washington. The deed to 8.2 acres of land was officially transferred to the State by Dartmouth College at a price of $2.1 million, to be financed by Dartmouth over 10 years. The property is located on the summit of the Northeast's highest peak. It directly abuts and will become part of the Mount Washington State Park, which is surrounded by the 750,000-acre White Mountain National Forest. In 1962, Dartmouth acquired 67 acres of land at the summit of Mount Washington. Fifty-nine acres were sold to the State in 1964, facilitating the creation of Mount Washington State Park. The remaining 8.2 acres were retained by Dartmouth, as they were subject to a 65-year lease signed in 1944 granting a third party all broadcasting rights at the summit. In 2002, the State of New Hampshire acquired the third party's interest in the lease, which was scheduled to terminate at the end of 2009. "We've been talking about this transaction since the state took over the leasehold in 2002; we've always thought that it was appropriate for the state to own this property," said Director of Dartmouth Real Estate Paul Olsen. "We wanted this sale to be finalized well before the lease ended so the State could maintain its broadcast facilities without the possibility of interruption." "Over many decades, we have enjoyed a very productive working relationship with Dartmouth College on the summit of Mount Washington," said George Bald, Commissioner of the Department of Resources and Economic Development. "This transfer allows the Division of Parks and Recreation to consolidate its management authority over summit operations while honoring Dartmouth's historic and continuing presence throughout the White Mountains." The informal ceremony took place at the property site, after a four-hour hike up Mount Washington by Dartmouth and New Hampshire State officials. The Mount Washington State Park was established to preserve and develop the summit's unusual scenic, scientific, historical, and recreational features for public use and enjoyment. The New Hampshire Division and Recreation is part of the Department of Resources and Economic Development and manages 72 state parks, campgrounds, historic sites, trails, waysides and natural areas. To learn more about the Division of Parks and Recreation, visit www.nhstateparks.org or call 603/271-3556. No, I have not been able to hike. I've hit up all the mountains around here and with the gas prices being what they are, I have not gone up north or out west to hike. I am very annoyed. June 9, 2008 - Hot, hot, hot! Wow, quite a hot one yesterday, today, and tomorrow! 95 or so base temp and a heat index of 105 or so? You'd think it was August or something! This is a good opportunity to go over some hot weather hiking tips. Honestly, I postponed a hike up a mountain I've never been to today because I didn't know how strenuous it was, nor have I really 'got into the groove' this year. * Honestly consider how fit you are. Hiking or doing anything in the heat puts many more times the normal stress on your lungs, heart, pulmonary system, and even your own mental health. * Don't wear cotton. Cotton absorbs your sweat and halts evaporation, thus making your sweat ineffective at cooling you off. Wear polyester instead. * Wear long-sleeved loose-fitting shirts and long poly pants. This keeps the sun off your skin and can help keep you cool. Hat, sunglasses, and sunscreen are a must as well. * If you are planning a route, higher up on a mountain will most likely be cooler. Also, if you have a choice between a ridgeline exposed or forested land, try the forested land. The shade makes a difference. If there are streams or the like, you can go wading to cool off. * Plan your hiking times to avoid strenuous activity from 12-3 or so, as this is the hottest time of the day. * Bring PLENTY of water. If you have the ability to carry or mix in some sort of electrolyte-replentishing thing like Gatorade, that would be a good idea. If you don't have this, don't forget to pack a little salt. Believe it or not you do need to replentish salt after a long day of hiking and sweating! You can lose 1-6 liters a day, especially if you breathe with your mouth open! * Do NOT rely on the fact that you think you will be able to drink from a stream or spring. This is a variable that should never even be a part of your survival equation. If one is present it should be a treat, not a requirement. * Watch our for sudden pop-up Thunderstorms! Here in New England it can be bright and sunny where the trailhead is, but over the next ridge a thunderstorm is coming in. Once you hear thunder either turn around or find shelter! * Hike with a buddy. Stop for a rest. There's nothing wrong with resting. Bring along a geology field guide or birding book if you get bored when stopped. * Stay hydrated: Drink lots of water as you go even if you don't feel thirsty. If you are not peeing or sweating you have a big problem on your hands. If you are experiencing cramps, overexhaustion, headache, irratibility possibly coupled with prolonged sweating, you are most likely dehyrated and also experiencing heat exhaustion. Heat exhaustion can be overcome easily. Sit in the shade or in cold water, drink cool water with 1 teaspoon of salt dissolved per liter of water (if not using supplements in the water) over the course of 30 minutes. * If a person is experiencing heat exhaustion, heat stroke is not far away. Heatstroke can occur even if the person is sitting in a cold pond of water. Basically by this point the person's brain starts to shut down things including the body's temperature regulation. If someone is experiencing any of these symptoms, call 911 immediately and cool them off: Skin becomes red and hot, they aren't sweating, they are hallucinating, becoming combative, or lapsing into uncounsiousness. Remove their clothes, spray water on them, and fan them. (fannig promotes evaporation which is what cools the body) Heatstroke can kill you within 20 to 30 minutes flat with no warning. * To put it into perspective, most everyone knows what Hypothermia is. Bad. You die. Stay warm. Well did you know that heat stroke is actually Hyperthermia? (body temperature way above normal) It is just as deadly except with no snow on the ground people somtimes forget about the fact that nature can be nasty. * If you have been without water and/or food and come across some, do not drink/eat it all at once. Drink slowly. Eat afterwards. Do not drink from ponds/streams unless absolutely necessary. If you have a water purification system then you can proceed according to the manufacturer's directions. * Remember that if you are hiking alone and you don't catch or ignore the signs of heat exhaustion, you may lose your normal faculties and be unable to cope with worsening heat exhaustion or heat stroke. You will die if untreated. My intended purpose for going there was for a light hike, geocaching, and to check out the place as I had never been. I pulled in and found that there was no ranger station at the entrance, and the ranger station itself was boarded up. Odd, I thought, as usually there is a parking fee. A few minutes later a DCR truck comes screaming down the road and parks behind me. The guy was apologetic, stating that they were working "up top" today and nobody was working in the shack. He needed to collect the $5 parking fee. I had no problem at all paying the fee as it goes to the park directly. I do, however, take issue with the fact that he was driving quite fast through the park and that he came to a screeching halt parking behind my vehicle. Do not ever block my car in, or any car for that matter, and do not speed in a park in which people may be walking. That set aside, the park itself was absolutely wonderful. The park consists of approximately 7,500 acres of land encompassing a few ponds, hiking trails, snowmobile trails, mountain bike trails, a swimming area, pavailion, and day-use picnic/grill sites. (No extra fee, first come first serve). Early in the 1900s the entire area burned. In the 20s, the State purchased the land. The Civilian Conservation Corps moved in and made it what it is today. You will still see their handywork in the dam and a few other structures in the area. Ruggles Pond is the main day-use area. This 10 acre pond offers crystal clear water for swimming and fishing. Picnic sites and a ball field with a pavilion are located nearby. There is a small boat launching ramp located at the Northern end of Wickett Pond. The Metacomet-Monadnock Trail traverses the forest boundaries and offers a small Adirondack shelter for trail users. For the hikers, you may hike on any trail and there are a lot! Everything from gentle double-track, paved road, hard pack single track, and even few scenic areas after a moderate climb that overlook a wonderful wooded valley. For the Mountain bikers you will find mostly single track and well posted trails (Moose Trax was really awesome) that wind through laurel glens. Not very technical, although there were a few small bridgerails to go over. Nothing bad. If you are a Geocacher you will actually find about 40 caches up here that were all part of the Great Northern tournament. Many of them are very easy so you should not have any problem with them. In short, if you are looking for a place not super out of the way, yet still far enough to enjoy yourself in an outdoor setting, Wendell is a nice place to go. I would advise checking the weather as the views can be limited from the pond so a pop-up thunderstorm may catch you by surprise. Although I was not there on a weekend I get the impression that the place would fill up on a nice weekend, so come early! Due to the lack of rain, wind, and hot temperatures, there is currently a red flag warning in effect for all of Western Massachusetts. Please refrain from starting campfires during this holiday weekend! Well, I am back from a business trip to California. Unfortunately I did not get to do any hiking in the mountains, but I did get to do some urban hiking. I soon realized that my shoes are packed out and not built for pounding the pavement. Yeesh! Currently I am in the works of planning a day hike to Mt. Monadnock. I have not been there before and I am told the view is great! Looking even further into the summer I am seeing Mt. Washington or Lake in the Clouds. That would be awesome. More closer to home I would like to mention that we have not received a lot of rain these past few days, and with the wind blowing all day I wouldn't be surprised if we have a raised fire danger tomorrow. Be careful! After doing some research I decided it was time for a new hiking pack. I was using a conversion pack from EMS up until now. It certainaly was useful, but I was annoyed with a few features/lack thereof. I wanted something with a daisy-chain on it, seperate compartments, internal solid frame as opposed to a plastic sheet, and if possible some sort of hydration compartment. The biggest thing was the daisy-chain and seperate compartments. I came up with the Osprey branded "Atmos 50" mens pack. It fits the bill, it is light, and has all of the options I want. I had doone some research on Moosejaw and various other websites. (I recommend Moosejaw highly, btw.) In the end I chose to not purchase online so I could actually try the pack and fiddle with it first. Also, it is nice to have a local retailer to complain to should something go wrong. The pack has come on two hiking trips, albeit short ones. Most of the hiking was done on level ground with no real weight in the pack. Sort of a 'break in period' if you will. What I was looking for is to work out some of the quirks before I go on some all-day or 1-2 night overnights. So far it seems to work well. I'll weigh in with some more specifics after a few longer trips! 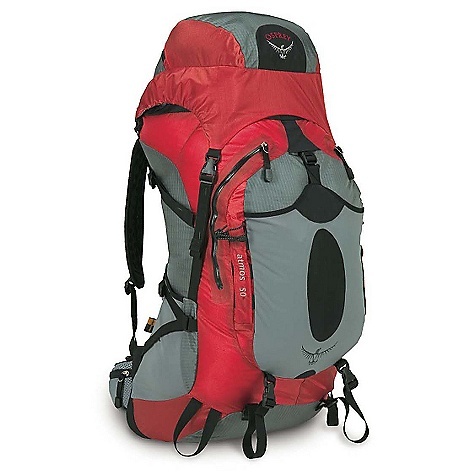 "The Atmos 50 by Osprey is for fastpacking - overnight to an entire hike of the AT. The all-new Atmos Series addresses the ultralight revolution as only Osprey could - with a suspension that really carries weight, and fabrics and materials that will realistically stand up to the rigors of use. The AirSpeed suspension sets the Atmos Series above all other ultralight packs. The Atmos frame is 6005-T6 alloy aluminum with two 6" x 5mm fiberglass struts providing flex in the middle. Unlike other mesh tensioned backpanels that are simply flat panels suspended from 4 tensioned corners of an X-frame, this panel is 3D contoured. Additionally, there is a lumbar contour at the bottom and the backpanel follows a back curvature. All contact surfaces are either breathable mesh or perforated, molded waffle foam. The backpanel supports the load well because it is under drum-like tension. When wearing the pack, rather than compressing the load with comp straps at the hips, the back sinks evenly into the lumbar area providing comfortable uniform pressure with no hot spots. stretch woven lycra front and side pockets and welded water resistant zippers. All this at under 3 lbs. !